Another year has come and gone. Like sands through the hourglass, so are the sakes of 2013… Year after year, I produce this semi-serious “Golden Masu Award” roundup, which is my totally biased take on the superior sakes, bodacious brews and nihonshu of note of the past year. The biggest change for me was that this year I began working as Brand Ambassador for Hakkaisan Sake Brewery. This has given me the amazing opportunity to travel, teach and introduce Hakkaisan sake to the world. That’s a wonderful thing, since Hakkaisan was my first premium sake back in 2005 and really changed my life. 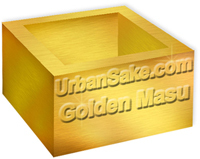 To avoid any whiff of conflict of interest, going forward I’ll exclude Hakkaisan from my all-in-good-fun “Golden Masu Award“, but for me, Hakkaisan is already an Golden Masu All Star in the Sake Hall of Fame. When life gives you lemons – as the saying goes – of course, you make lemonade. And when your sake brewery is located smack dab in the middle of the famous Yoshino cedar forests of Nara Prefecture, it goes without saying, you make a Taruzake, or cedar cask aged sake. Taru sake was once very common in Japan as sake was brewed and stored in wooden barrels until steel brewing tanks came along in the early 20th Century. As such, Taru evokes an extremely old school and nostalgic sake vibe. I’ve found that Yatagarasu Junmai Taru from the Kitaoka Honten Sake Brewery is a true classic of the Taru genre. For this style of cedar-laced sake, subtlety is king. Too much cedar and it’s like sipping grandma’s closet. For my taste, the Yatagarasu gets the balance just right. Enough cedar to invoke a lovely warm woody taste, but not at all overpowering. The clean, dry sake used is the perfect backdrop for the cedar taste. So, for the closest thing to sake time travel, transport yourself back to the days of the Samurai with just one sip of taru sake. Most premium sake you see out there as been charcoal filtered before bottling to achieve a clarity and crystal clear body you just can’t achieve otherwise. There is a growing movement, however, towards “muroka” style sakes, which skip this charcoal filtering step and lets a sake show more of its ‘back-to-nature’ character. Murokas can be more dimensioned, slightly amber-ish in color and full of personality. One of my favorite muroka sakes is the Naraman Bin Hiire Junmai Muroka from Fukushima’s Yumegokoro Sake Brewery. This junmai offers a flavor-forward palate laced with a nice minerality, all while maintaining its balance. Great full flavors that speak to the depth of what a muroka style sake can offer. A slightly higher alcohol at 16.5% adds a bit of vrooom that murokas need to get off the ground. If you’re just getting started exploring muroka sake, be sure to try this offering from Naraman. No better way to get a splash of sake personality than with a muroka. 7th Generation Sake Brewery President Takaaki Yamauchi of Ibaraki’s Huchu Homare Sake Brewery is a legend for his revival of the heirloom wataribune rice strain. Yamauchi-san was looking for a local sake rice to use at his brewery and heard tell of wataribune, but local farmers were no longer growing it. In fact no one was growing it. He thought it lost to history until he found some frozen seedlings at a local agricultural research center in Ibaraki. Using a mere tablespoon of seed, he worked with a local farmer to revive the lost rice varietal and in 1990 produced his first sake using wataribune. Today, this amazing legacy gives us Wataribune 55 Junmai Ginjo. I can sincerely say this sake is always a joy to drink. It’s exceedingly smooth and has a hint of richness on the palate that just entices you to take another sip – and then another. Also, Wataribune 55 is an exceptionally well crafted and technically masterful sake. You can taste the history, hard work and dedication in every ounce. I think perhaps Wataribune was destined for success here in the U.S. – who could resist the story of this ultimate sake rice comeback kid? Whenever I’m pouring sake at an event, I always get asked “Do you have any of that cloudy white sake? What’s it called?” Well, it’s called Nigori, and I’m always happy to introduce people to this unique style of sake. Nigori style sake is coarsely pressed after brewing, leaving bits of rice starch behind, which lend the milky white/cloudy character to its appearance. Styles of nigori vary widely from sticky sweet to quite dry and from thick and viscous to wispy and light. If you find yourself with at least one foot in the nigori lover’s camp, take a gander at the much loved Kamoizumi Ginjo Nigori from the Kamoizumi Shuzo in Hiroshima. I know from personal experience, this is a Nigori Lover’s Nigori. It’s a ginjo grade sake, so you’ll note it’s lightly fortified with distilled brewer’s alcohol, which contributes much to the round and rich character of this creamy treat. The body is quite full and thick and will readily coat your glass. As this sake achieves a great balance between sweet and dry, you can pair it with many foods, but, with a nod to my sweet tooth, I especially enjoy it with desserts. A few sips of this nigori alongside a decadent wedge of chocolate cake or an over-sized chocolate chip cookie is a little slice of heaven. What better way to get your nigori on?! Kanpai! Once upon a time, a wise gift recipient once said “The best gifts come in small packages.” Now, this person was probably someone who had just received a diamond ring or the keys to a Porsche. When it comes to sake brewery size however, I know there are top quality sakes made by large, medium and small sized breweries. And as for me, I’m always fascinated with top tier sakes coming from extreme micro breweries. We’re talking 2-4 people brewing a limited amount of sake. With a small team and a lot of determination, micro breweries can make magic. One such place I got to know a little better in 2013 was Ryujin Shuzo in Gunma. Of the handful of brewery workers at Ryujin, TWO are guild-licensed Master Brewers known as “Toji”. Needless to say, having two master brewers on the team doubles the expertise and delivers some pretty outstanding sake. One such sake is the exquisite Oze no Yukidoke Junmai Daiginjo. This sake is smooth as silk and made with 100% yamadanishiki sake rice milled to 40% remaining. The palate sings with tropical fruit and banana notes paired with an enchanting aroma to match. Elegant, luscious, commanding and masterful – it is a sake to sip, savor and study. Truly a mega sake from a micro brewery. Congratulations and Kanpai to all the Golden Masu Honorees! I am sincerely hoping that 2014 will bring many wonderful sake journeys to us all. Kanpai and Happy New Year to everyone! As a beginner to the world of sake, I really appreciated this write up for each award. Keep them coming! Sake and Nobu at De Gustibus Cooking School Sake Tourism to Japan: Sake Journeys!